Geneva – IOM, the UN Migration Agency, reports that 150,982 migrants and refugees entered Europe by sea in 2017 through 1 November, with about 75 per cent arriving in Italy and the remainder divided between Greece, Cyprus and Spain. This compares with 335,158 arrivals across the region through the same period last year. 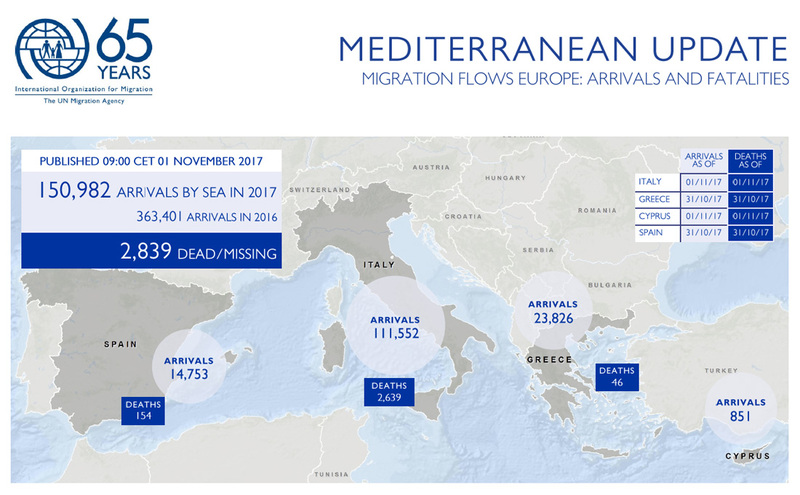 2017 marks the fourth straight year migrant arrivals to Europe by sea reached the 150,000-person benchmark, but it is not the earliest time in the year that threshold was reached. In 2016 the Mediterranean region hit that benchmark in early March, and in July in 2015. During the calendar year 2015, there were single months when as many as 150,000 migrants entered by sea, principally through Greece. IOM Rome reported Thursday (2 November) that 260 migrants were rescued on Tuesday, 31 October, in five different rescue operations, while another 975 were rescued the following day (1 November) in 12 separate rescue operations carried out by Italian and international ships. The remains of eight victims were recovered in waters north of the Libyan coast. IOM Athens’ Kelly Namia reported Thursday (2 November) of at least two incidents this week off the islands of Lesvos requiring search and rescue operations. The Hellenic Coast Guard rescued 147 migrants and transferred them to the two islands. IOM Cyprus’ Dimitrios Tsagalas reported that 34 migrants of Arab origin were picked up in the village of Pyla at Larnaca District this past weekend, in what appears to be growing use of a new pathway into Europe. Cyprus media reported these migrants departed Turkey’s Mersin port by boat Saturday (28 October), reaching Cyprus without detection and travelling by truck to Pyla, a village in the UN Buffer Zone, before crossing into the Republic. All migrants have since been transferred to Purnara’s Reception Centre. According to Republic of Cyprus authorities, this is the seventh recorded incident of crossing via the UN Buffer Zone in 2017. Authorities have recorded 105 migrants using this route to enter the Republic this year. IOM Cyprus notes that the National Plan “NAFKRATIS” – which deals with the management and provision of help to persons in need – has been activated 15 times in 2017, and that a total of 850 migrants have arrived in Cyprus by boat, nearly three times 2016’s total of 345 migrants (through nine months). IOM Libya’s Christine Petré reported Thursday that on 31 October, 299 migrants (231 men, 30 women and 29 children) were rescued from one rubber dinghy off the Libyan capital, Tripoli. IOM assisted at the disembarkation point. She reported one woman had to be transferred to a hospital for further medical assistance. The majority of the migrants came from Guinea Conakry, Mali, Cote d’Ivoire, Cameroon and Senegal. So far in 2017, 19,134 migrants have been rescued or intercepted in Libyan waters, Petré reported. Worldwide, IOM’s Missing Migrants Project (MMP) has recorded the deaths of 4,866 people migrating in 2017 – 16 persons per day – with just over eight weeks remaining in the year. Deaths in the Mediterranean Sea continue to account for a majority of the world’s migrant fatalities – now up to 2,839 for the year, or nearly 60 per cent of the 2017 total. Last year at this time the region recorded deaths of 4,150 migrants (see chart below). In the Central Mediterranean this past week, the remains of eight people were recovered Wednesday (1 November) during rescue operations off the coast of Libya. In the Western Mediterranean on Monday (30 October), two young men died after their boat capsized off the coast of Mostaganem in Algeria. The three migrants listed as missing from a shipwreck of 29 October off Tangiers are being counted now as fatalities. Two accidents were recorded in Europe, near the Italian-Austrian border: one migrant lost his life on 30 October in a vehicle accident on the A23 motorway near Udine, in Italy; and another migrant was hit by a train in Bolzano, Italy, on 1 November. Additionally, IOM’s Missing Migrants Project recorded the first death this year off the coast of the Canary Islands: the remains of one man were recovered near Morro Jable in Fuerteventura on 31 October. In Southeast Asia, six Rohingya died and one went missing after two boats carrying dozens of people fleeing violence in Myanmar capsized off the coast of Bangladesh over two days: on 31 October, four Rohingya (a woman and three children), drowned when a small wooden fishing boat capsized off Jaliapalong Union, Ukhiya sub-district. This tragedy came a day after (30 October) a boat carrying approximately 30 Rohingya capsized at Sabrang Union, Teknaf sub-district. Two people died and one remains missing. Since 31 August, IOM’s Missing Migrants Project has recorded the deaths of 249 Rohingya on the Bangladesh-Myanmar border.